It's a situation that many people the world over go through every day: they work hard, they do well, they show loyalty to their employers, and then they get made redundant. Ludicrously, there are no less than three drivers in Champ Car who are simultaneously experiencing that situation right now: Oriol Servia, who has been dumped by Forsythe Championship Racing; Ryan Dalziel, who has been released by Pacific Coast Motorsports; and Alex Tagliani, whose ride at Rocketsports Racing is... open to question, let's say. Miracles can happen, and perhaps one or two of this unfortunate trio will make it to Surfers Paradise and Mexico City. But as of right now, all three are congregating near the dole queue, but for a variety of different reasons. It was a race-by-race deal, Oriol knew that when he joined Forsythe. At first he was there to stand in for Paul Tracy, who damaged his back in a seemingly innocuous accident in Long Beach. Once Tracy returned, Servia switched over to the No. 7 car to replace Mario Dominguez, and since then the Miami-based Catalan has added a third place in San Jose and fourth in Elkhart Lake. He has also, more often than not, been ahead of his team-mate. Is Servia as fast as Sebastien Bourdais, Justin Wilson or Will Power? No. But you could have a lengthy debate about him being the equal to anyone else in the field. No, okay, he isn't as fast as Paul Tracy either if the 2003 champion is on form and given a car to his liking. But the number of times that has happened this year could be counted on your thumbs. When the car has been at its most difficult, Servia's sense of restraint in qualifying has often teased a stronger performance out of it than Tracy. This has been exacerbated by Paul's 'rip it up and start again' attitude to flying laps. If he feels he's overcooked one or two corners, he'll tend to back off and go for another - halfway through which of course his Bridgestones are past their prime. Servia, on the other hand, will press on through, believing that others will have done the same - made mistakes and then concentrated on getting the rest right. His way, more often than not, has proven the right way. Paul's looking for perfection; Oriol's compromising. 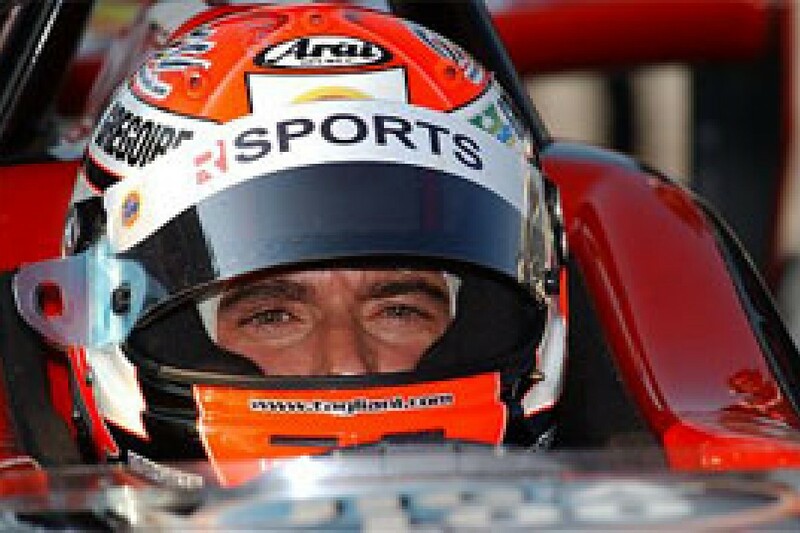 In his last column for Autosport.com, Tracy paid tribute to Servia saying his feedback was like a 'carbon-copy' of his own. In other words, consistent feedback was giving to the engineers the sort of platform on which to make progress. Now he finds himself replaced by David Martinez, in order to fulfil Champ Car's obligation to the Mexico City race organisers to run two Mexicans in the field at their home race. It's not that Martinez did not deserve a race. As anyone who witnessed his debut at Mexico City last year will agree, he did a startlingly good job without the guidance of someone more experienced in the second car. He was partnering Buddy Rice, the pair of them standing in for Tracy (injured) and AJ Allmendinger (sacked). Not only did he outqualify the 2004 Indy 500 winner, he also outraced him in changeable conditions. Given that he was good in Atlantics but hardly a potential great, it was most impressive. More recently, Martinez did an excellent job at Sebring: no offs, no fuss, just quiet constructive improvement both to himself and to the car thanks to good feedback to his engineers. His under-the-radar approach should gel nicely with the team, even if it is only for two races. However, should Martinez get the ride at the expense of Servia? Hell no. Not unless he was under consideration for a permanent seat on the team in 2008. He's not. And neither, sadly, is Servia. If ever there was a driver that seemed set for a team long-term, it's Ryan Dalziel. Having previously raced for Pacific Coast Motorsports in ALMS and Grand-Am, and already proven an excellent single-seater driver in Champ Car Atlantics, he was the obvious choice to pilot the No. 28 car this year. Alex Figge would partner him, and though some questioned his provenance, let's remember that (a) Alex was a race-winner in Atlantics, (b) he has on occasion out-performed Dalziel this year, and (c) his dad owns the team. Don't whinge about nepotism though: without Tom Figge, this team would probably not exist, and certainly wouldn't be in Champ Car. Now, Ryan has effectively had the last three years of his career funded by the Figges. There was no resentment there - he and Alex are best buddies, and the Figge and Dalziel clans got on superbly (though a little tension may have crept in now...). Alex doubtless learned a lot from Ryan. It was all cosy. 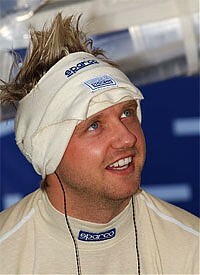 And Dalziel's driving this year has ranged from better than average to superb. The whole Pacific Coast Motorsports team, with Dalziel at its cutting edge, has made great strides, and it ceased to be a surprise to see his silver car about halfway up the grid, with a qualifying time around a second off pole. At the start of the year, the gap was over two seconds. Ryan's reward has been redundancy. It would have been surprising had this occurred at the end of the season. But with two races to go, it's a shock. He has been replaced by Dominguez, the man who subbed for him in San Jose when the Scot fell off his bike and broke his collar-bone. 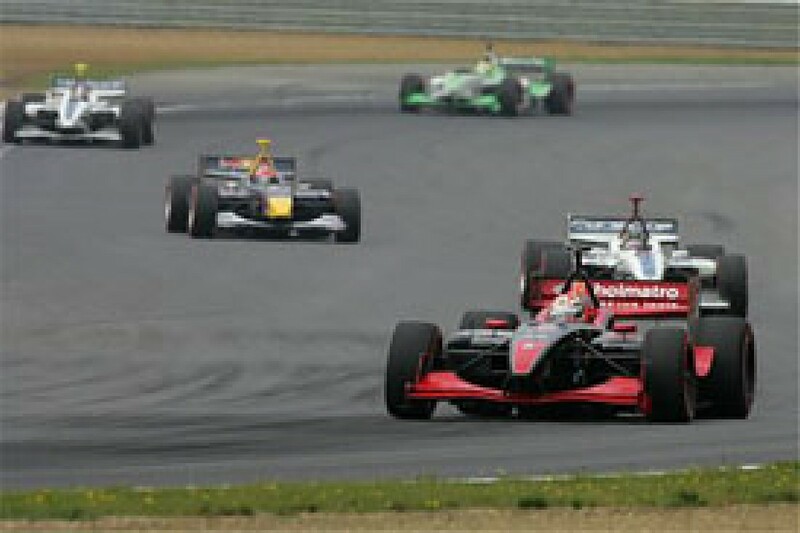 But although both Servia and Dalziel have been replaced by Mexicans, there is a difference between their circumstances. Dominguez has got his place at Pacific Coast because the team is working on a deal with a Mexican sponsor for next year. Should the squad land its pesos, Mario will likely be retained for 2008. Senior team members have also let on that there was a feeling that Ryan and Alex were too friendly, that an atmosphere of complacency had been fostered. In other words, there was not enough of an intra-team 'edge', where rivalry and endeavour drive the team forward. And Dominguez's feedback in his one-off race apparently pushed the team's street course set-up forward considerably. Even Dalziel, shocked though he is, understands fully as to why the decision - however hard-nosed - was taken, but he is upset about the manner in which it was broken to him, and that he was not kept in the loop and told that losing his ride before the end of the season was a possibility. For him, the news was a lightning bolt; he is convinced for many others in the team that it was rather less of a surprise. But it's hard also to disagree with Alex Figge's observation that this move could work out for all parties. Alex has since proven with his startling Sebring test performances that he has made big gains with his car development (and confidence). And Dalziel has gained more headlines through being dumped than he did even with his attention-grabbing efforts at places like Toronto (race day), Edmonton (qualifying), and Road America (first qualifying). Rumours abound right now as to the state of Rocketsports Racing. Not the sort of rumours you necessarily read in magazines or on websites, but word-of-mouth rumours. During down time at Sebring testing this week, much of the talk surrounded the absentees. Will Alex Tagliani be racing for Rocketsports to year's end? Will the team even make it down to Surfers Paradise and Mexico City? If so, will the team exist in 2008? And do enough people care? Given how often he has run competitively, it's taken an amazing series of misfortunes to keep him from the podium in 2007. Yet unless you examine the cases, it's easy to surmise that he's a fading star. Deep down, Alex probably knows that, weekend in, weekend out, he's not as quick as the top five drivers in the series. But that still leaves him equal to or better than a whole lot of others, and this in a year where the arrival of several European discontents has raised Champ Car's average talent quota by several notches. More to the point, Alex is close enough to the aces that on his best days, he can pretty much match them, and there are certain areas where he truly excels. Just a couple of months ago, one long-established team owner remarked to this writer: "There are only three drivers I can think of who can wring everything out of a bad car: Sebastien Bourdais, Bruno Junqueira, and Alex Tagliani." When you consider who doesn't make that list, that is quite some compliment. And yet it's important to emphasise that Rocketsports have not often supplied Tagliani with a 'bad car' this year. 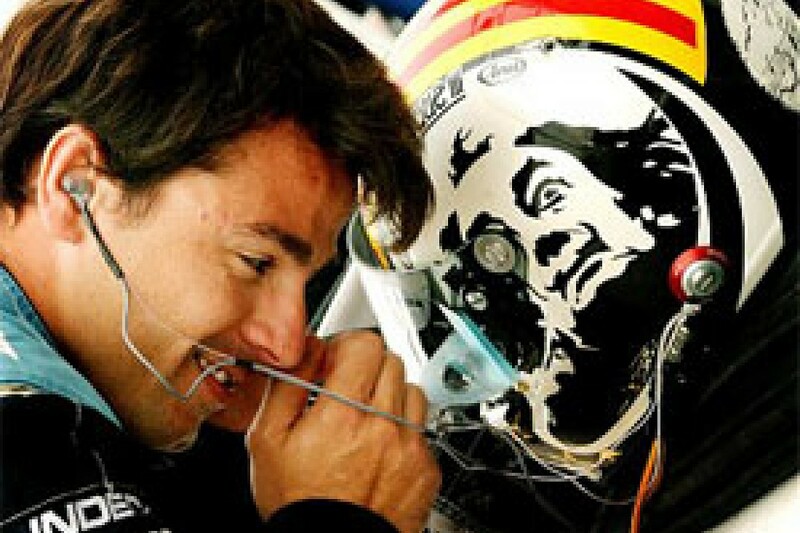 In fact, had there been proper communication in the debatable 'technical partnership' between Rocketsports and RuSPORT (who for the first 10 races came under the umbrella heading of 'RSPORTS'), Tagliani wouldn't have had the crippling understeer that affected him in Toronto and San Jose, and his kinda-team-mate Justin Wilson wouldn't have had the alarming oversteer that buckled his stride at Road America. Other than that, the Rocketsports car has been acceptably good. What has happened to limit Tagliani's potential 90 per cent of the time has been bad luck. Bad luck, that is, for the driver, though you could say misjudgements on the part of others, be they team members or equipment suppliers. There have been refuelling rig problems at Las Vegas (though Tag is hardly unique in this regard), Houston (where after his first pitstop he had to pit again a lap later and yet again the following lap as twice his car failed to take on fuel) and Cleveland (just one screw-up this time). At both Edmonton and San Jose, he ran out of fuel on-track, and in the latter event this really hurt, because following the infamous Wilson/Dan Clarke accident, Tagliani he might have won. He certainly appeared to have the measure of Servia and Neel Jani in terms of pace once he had got into the top three, and he would likely have fought Robert Doornbos for victory. As things transpired, the gearbox broke later in the race anyway. Tagliani's consistency can still amaze. Only twice this year could you say he's given away points. At Mont-Tremblant he and Wilson ran dry (stiff) set-ups which when the rains came, rendered their cars hugely tricky. Alex nonetheless climbed into the top six in the wet (after a brave outside pass on his team-mate) but on the final lap, just three corners from home, he tried a manoeuvre on fifth-placed Jani, slid off-course and dropped to eighth by the chequer. For the same reason - dry set-up - Tagliani was on the back foot in Toronto's rains. After Simon Pagenaud punctured the Rocketsports car's tyre, Alex's crew did not have the time to adjust his tyre pressures so he was on overinflated dries when the clouds dumped their load, and he skated into a tyre barrier. Where he was joined (and trapped!) by Servia's car. Even aside from the discussions about the team's sponsorship - or lack thereof - the European races were a bad joke for Rocketsports (which had now re-re-branded under its own name, although the 'technical partnership' with the re-re-branded RuSPORT continued). At Zolder, the team inexplicably called Tagliani to pit out of sequence while he was running fifth, and at Assen he was in a first-lap collision with a spinning Junqueira that bent his suspension and damaged his front wing. Despite all these setbacks - or perhaps, fired up by them - throughout the year Tagliani has been commendably close to, or on a few occasions ahead of a driver as formidable as Wilson who is arguably the quickest driver in the series. So who has been hit hardest by Lady Luck's truncheon? It's not Dalziel. Though his removal from the team was clumsily handled, it was not bad luck, but a case of his good luck - of having a loyal benefactor like Tom Figge for three years - finally expiring. Having said that, Figge could not have picked a more worthy beneficiary. Having initially wondered whether Dalziel was overrated (a superb Atlantic driver in the pre-Mazda days did not always make for a potential Champ Car great), through the course of 2007 this writer has become a believer in Ryan's potential. Any funded team (yes, there are some) should have him in their top three candidates for '08. It would be a real shame to lose yet another strong open-wheel prospect to sportscars. So the real fight over who constitutes the unluckiest driver in Champ Car in 2007 is between Servia and Tagliani, and it all hinges on who - if either - gets to drive in the final two rounds. And after much debate, it's got to be Tagliani that gets Champ Car's least coveted award. While both drivers have excelled at times, in Oriol's case it has been visible, it has been memorable, and it has enabled him to fight for fifth in the championship. For Tagliani, there have been fewer highlights, fewer saving graces yet taking into account the results that got away, he could have been fighting for fifth with Oriol, with two podiums and a win to his name. But then 'Woulda-coulda-shoulda' is the working title of almost every chapter in Tagliani's Champ Car career. We may be assuming the worst here - maybe he and Rocketsports will see out the season together. The point is, it's wrong that it should even be under discussion. It's not that long ago that Paul Gentilozzi said: "One of the two worst mistakes I've made as a team owner was letting go of Tag at the end of 2004." One hopes he will remember that.